Could my worship keep me from an eternal home in Heaven? Is the worship I offer so important that I could spend an eternity in Hell for "vain" worship? Many today will say, "No, it does not matter how you worship as long as you are honest and sincere." Others try to play down this subject as being unimportant. My friends, this question is very important. We are duty-bound to make sure we worship God in a way that pleases him! It matters not what opinions I have on this subject. Rather, the deciding factor is "What saith the Scripture?" Let us see what the Bible says about my worship. As we think about this subject, I would like us to take an "overview" of the Bible and notice God's attitude toward those who were not worshiping acceptably. Exodus 20 records the giving of the Ten Commandments to Moses. I find it very interesting that the first seven verses have to do with the Jews' actions and attitudes toward God. God told the people not to have any other gods, not to bow down to any graven images, nor serve them, and not to take God's name in vain (Exod. 20:3-7). As God placed these Ten Commandments into effect, he let the Israelites know that there was only one way that they could please him. At this time, we see a God that expected his people to follow his commands to the letter without variation. Why do we think that God has changed his mind concerning his worship? Yes, the Law has changed, but the fact that God expects us to obey him to the letter has not. At the beginning of this chapter, we read how God did not want the Israelites to become as the heathen in their idolatry. God, in the first five verses, shows the folly of the heathen for worshiping idols, and how the heathen have fooled themselves. God said, "The customs of the people are vain" (Jer. 10:3). As God continues to show the foolishness of these people, He says, "They deck it with silver and with gold; they fasten it with nails and with hammers, that it move not. They are upright as the palm tree, but speak not: they must needs be borne, because they cannot go. Be not afraid of them; for they cannot do evil, neither also is it in them to do good" (Jer. 10:4-5). Jeremiah says something that we need to learn and learn well, "0 Lord, I know that the way of man is not in himself: it is not in man that walketh to direct his steps" (10:23). Why study this chapter? It is be-cause during this time, the idolatrous cultures were known for worshiping whichever gods they chose. There were so many gods at this time, you could choose to worship whichever god you wanted. Those living in Jeremiah's time were truly trying to "direct their own steps." If it did not matter how you worshiped God, why was God "legislating" these cold, impersonal commandments to the people? Was God not wanting these people to do what seemed to be the best? Was God condemning the practices of an honest and sincere group of heathens? Why did not God simply teach them how to "get along," and "love" one another, despite the "petty" differences these idolaters may have had with the Jews? God continues to plead for the people to come back, and said in Malachi 3:10-12, "Bring ye all the tithes into the storehouse, that there may be meat in mine house, and prove me now herewith, saith the Lord of hosts, if I will not open you the windows of heaven, and pour you out a blessing, that there shall not be room enough to receive it. And I will rebuke the devourer for your sakes, and he shall not destroy the fruits of your ground; neither shall your vine cast her fruit before the time in the field, saith the Lord of hosts. And all nations shall call you blessed: for ye shall be a delightsome land, saith the Lord of hosts." The Lord obviously wanted them to come back and receive that great blessing. However, if it did not matter how they worshiped, why was God pleading for them to repent in Malachi 3:7? Looking to the New Testament, we read that Jesus had encounters with those who were worshiping God in vain. John 4 is but one example. This chapter records Jesus' meeting with the Samaritan woman at the well of Jacob. The Samaritan woman thought that it did not matter how or where you worship. You can see this when she told Jesus, "Our fathers worshiped in this mountain; and ye say, that in Jerusalem is the place where men ought to worship" (John 4:20). She gives the impression that it does not matter how one worships. "You worship in Jerusalem, and we worship here, what is the difference?" Jesus tells her that it does matter, and in fact, there will soon be a change. True worshipers will no longer have to go to Jerusalem to worship God. Jesus said, "Ye worship ye know not what: we know what we worship: for salvation is of the Jews. But the hour cometh, and now is, when the true worshipers shall worship the Father in spirit and in truth: for the Father seeketh such to worship him. God is a Spirit: and they that worship him must worship him in spirit and in truth" (John 4:22-24). What did Jesus mean when he said, "God is a Spirit: and they that worship him must worship him in spirit and in truth" (John 4:24)? These words have significant meaning, and must be understood if we wish to please God with our worship. The word "in" means "in connection with." It does not mean "inside of." Jesus was literally saying that we must worship in connection with the spirit, and in connection with the truth. What is the "spirit"? It is those things related to the spiritual realm. Jesus shows that the true worshipers need to be focused on spiritual matters, not physical. Paul tells us, "For the kingdom of God is not meat and drink; but righteousness, and peace, and joy in the Holy Ghost" (Rom. 14:17). That is why we do not have pie suppers, bingo, etc.! The church and its worship is not to cater to the physical needs, but the spiritual. We have another responsibility. That is to worship "in connection with the truth." 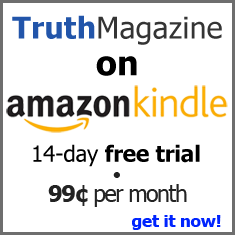 What is the "truth"? Let Jesus answer, "Sanctify them through thy truth: thy word is truth" (John 17:17). In order for our worship to be acceptable to God, we must worship with our focus on things spiritual, and worship in connection with what the Bible says! Peter said, "If any man speak, let him speak as the oracles of God; if any man minister, let him do it as of the ability which God giveth: that God in all things may be glorified through Jesus Christ, to whom be praise and dominion for ever and ever. Amen" (1 Pet. 4:11). The only truth we know is what has been revealed in God's most Holy Word. Our worship must come from what has been revealed. For anyone to try to worship God based on what has not been said, or for anyone to teach others to worship God in that way, is to condemn yourself to an eternity in Hell. To deviate from God's plan of worship is to jeopardize your soul, and the souls that follow you! Here Paul is recorded as rebuking the Corinthians for not partaking of the Lord's supper as they should. Paul declares (v. 23) that the things he is saying are from the Lord. He appeals to the right authority. He then proceeded to correct these brethren for their unfaithfulness in taking the Lord's supper. Here Paul tells these men and women that if they do not partake in a worthy manner, they are guilty of the body and blood of Christ and are eating and drinking damnation to themselves (1 Cor. 11:27, 29). Does this sound like it does not matter how we worship? Does this sound like our partaking of the Lord's Supper will not effect our eternal salvation? Paul ends this by telling the Corinthians that some of them are weak as a result of their unfaithfulness, while others sleep (spiritually dead while they live, 1 Cor. 11:30).